MOSCOW, Russia -- Russia's decision last week to sign a peace accord on Ukraine does not mean that the Kremlin is backing down, rather that President Vladimir Putin is prepared to be patient in pursuit of his ultimate objective. 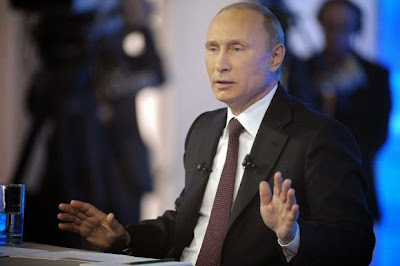 Putin takes part in a live broadcast nationwide phone-in in Moscow April 17, 2014. That aim, his own reflections and those of people close to his way of thinking seem to indicate, is one day to re-unite Russian speaking peoples, including those living within the borders of Ukraine, within one common home. As a skilled tactician, Putin knows that to push too fast to achieve this ambition could be damaging for Russia - as demonstrated by the Western threat of tough sanctions and Europe's rush to wean itself off Russian gas supplies. Signing the four-way agreement on Ukraine in Geneva last week, and thereby showing the West that it was willing to compromise, made tactical sense for Russia. With another four years before he needs to seek re-election, and the strong chance of winning another 6-year term after that, Putin can take his time, giving him an advantage over his Western rivals whose policies are driven by more short-term imperatives. "Now the main thing is to keep the powder dry and be prepared for the eventuality that the crisis in Ukraine is going to last a long time," said Fyodor Lukyanov, editor of Russia in Global Affairs, a journal which has the Russian foreign minister on its editorial board. "Agreements will be broken and then made again. Russia, for once, is not on the defensive, it is advancing. That means it doesn't have to get flustered and can keep plowing its furrow." Putin's long game means he is unlikely to actively seek to involve Russian in an armed conflict over Ukraine any time soon. But equally, it means that European states will have to adapt to a long-term future when persistent sanctions complicate their trade relations and with the threat of disruption to their Russian gas supplies hanging over them constantly. The Kremlin's official objectives in Ukraine are limited: protecting Russia's own security, countering NATO expansion, and helping Russian-speaking residents of Ukraine if they come under threat of persecution. Russia denies any plans to invade. Last week at Geneva's InterContinental Hotel, chief diplomats from Russia, the European Union, the United States and Ukraine signed a document calling on illegal armed groups in Ukraine - including the pro-Russian separatists occupying more than a dozen public buildings - to disarm and go home. By Sunday, the deal was already fraying, after several people were killed in a shootout at a checkpoint manned by separatists. Russia blamed Kiev for failing to implement the Geneva deal. Still, people close to the talks said they were notable because it was the first time, in multiple attempts, that Russian's foreign minister, Sergei Lavrov, has sat down for discussions on Ukraine with a mandate to do a deal. But one European diplomat expressed skepticism, saying the agreement was a feint by Moscow. By showing it was prepared to talk, the diplomat said, the Kremlin relieved the diplomatic pressure that was building, and bought some time before further sanctions were imposed. "Talks and compromises are just part of his (Putin's) tactics," said the diplomat, who spoke on condition of anonymity and stressed he was expressing his private opinion. "He wants to have Ukraine." Russia's offer of compromise could widen differences inside the Western coalition assembled against the Kremlin, something that would only benefit the Kremlin. There are already differences between the United States, which is hawkish on sanctions, and a more cautious Europe where many countries are determined to avoid a costly confrontation. Behind the standard, official Kremlin line on its objectives in Ukraine, when Putin or his associates offer up occasional glimpses of what he is thinking, evidence emerges of a more expansive set of aims. On Thursday, during a question and answer session that was televised live, Putin at one point reflected on how during tsarist rule, large parts of eastern and southern Ukraine belonged to Russia and were known as Novorossiya - literally, New Russia. "All these were territories which were handed over to Ukraine in the 1920s by the Soviet government. Why they did that, God knows," he said. Those remarks were a brief interlude in a program which lasted just short of four hours and covered dozens of topics, but they were noted by Kremlin-watchers as highly significant. "Now the aim is Novorossiya," Andrei Illarionov, a former economic advisor to Putin who is now a critic, wrote on his blog, setting out what he believes is the Kremlin's thinking. "It is the historic mission of the Russian person." Putin's spokesman Dmitry Peskov, when asked to elaborate on what Putin had meant by his comments on "Novorossiya" and Tsarist-era borders, declined to comment. The thesis of a Russian nation divided by artificial national borders has been developed by people who are close to Putin's way of thinking. These include senior figures in the Russian Orthodox Church. Putin displayed his closeness to the church on Saturday night when he appeared at an Easter service in Moscow's Church of Christ the Saviour, and received a personal blessing from Patriarch Kirill, leader of the church. "Millions of Russian people live, and continue to live, in Ukraine, several million Ukrainians continue to live in Russia," said Metropolitan Hilarion, head of the church's external relations department and one of the patriarch's closest aides. "We have a common language, a common culture, we have a common past and I believe deeply that we have a common future," he said in comments posted on the church's Internet site. "The political state of affairs which replaces simple common sense, interferes in people's fates, destroys them, and like a knife cuts through human relationships, tearing the ties between peoples, is, after all, only temporary in nature." Mr. Putin expressed his wish to unit all russkikh people, it is very good idea. In such case he should unite Belorus, Ukraine and western and northern lands of Russian Federation all the way to the border of Moscow region and call the new country Kievskaya Rus'. It could be new subject of a Federation in which each subject will have high level of independence and rights of referendums. I would support such unity where Kiev is in charge.